Little Women Farmhouse: Kitchen Renovation Reveal! Hey Friends! I've been excited about the idea of this blog post for months now... like, since before we had the keys for the house in our hands. I had all these dreams floating around in my mind since the moment we put an offer in on this house, and it's such a joy to see all of the plans as reality now! I feel so at home when I step into my kitchen. So, the thing is, it's still not complete. We put in a last big shove last week and finished up a lot of the work, but we still have a number of small details to finish. But it's "finished enough," and I'm too impatient to wait any longer. We did nearly all of the work ourselves, and while it has been a lot of work- especially with three little girls - it has been worth it! I'm so thankful for a husband who knows carpentry! I'll share details from left to right :). This little corner is our dining area. 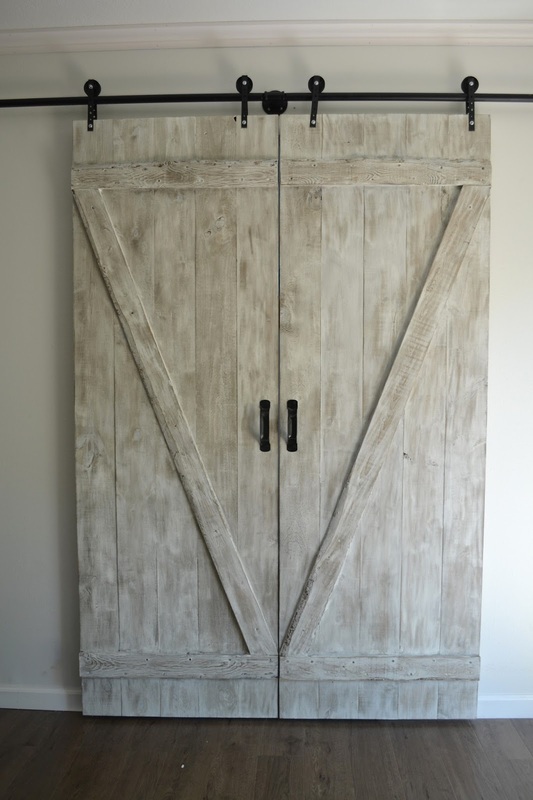 My husband built the barn doors and sliding hardware, and I finished them. I painted the Daily Bread sign, which is my reminder that we need time with Jesus each day just as much as we need time eating at the table. The curtains are from Ikea, and the table I just re-finished. To make our barn doors, we used this plan. They were fairly simple, and we finished them in less than a week. 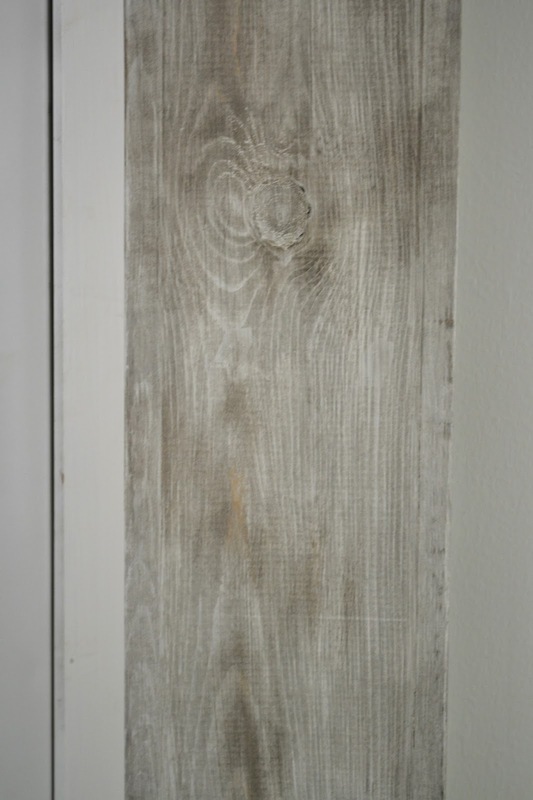 To get this finish, I used a dark walnut stain and then one layer of white chalk paint and distressed with sand paper. Our table was still functional, so we figured we should keep it. But it was an eye sore with the rest of our renovation, so I spent time giving it a makeover that would fit our kitchen. It took me a long time (but I kept procrastinating with other projects, to be honest), but I'm so thankful now that it's finished! I used dark walnut stain on the seats and table top and several layers of white chalk paint on the backs and legs. Old barn wood wins my heart. I just love the look of it! We bought some from a local seller (it's pretty easy to find when you live in rural Indiana) for these open shelves. The shelving brackets are from Menards. I painted the Ball jars and made the Millers & Co sign. The plants are from Ikea. We actually intend to use these open shelves for our plates and cups, but we need a middle bracket to ensure their stability first. Barn wood is heavy! 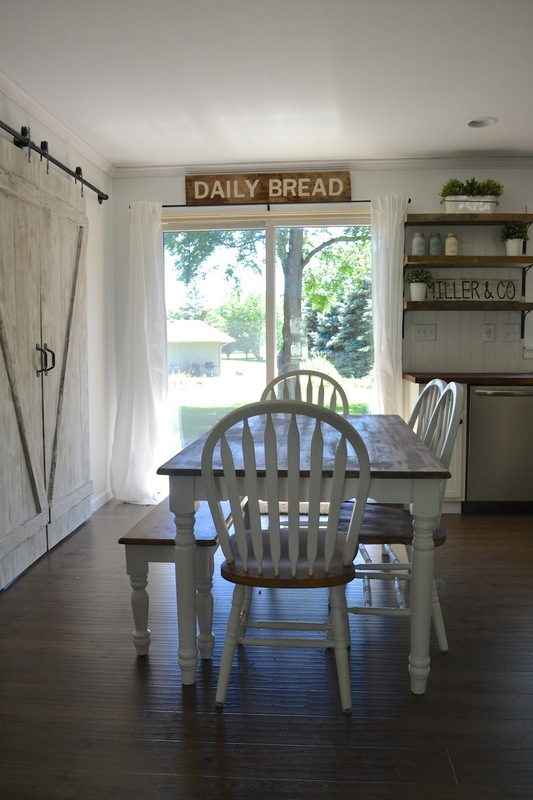 Those barn doors lead into our laundry room and half bath. They make me a little more excited about doing laundry. My farmhouse sink! It's from Ikea, since theirs seems to be the best bang for your buck from all of my research. I really do love it. But shh, don't look underneath it. This is one part of the kitchen we haven't finished yet! We cut down cabinets to fit the sink, and so we need to fill in a section and then finish painting. The pendant light is from Lowes. The cabinets are from Menards, and my husband added in bead board. We painted them Benjamin Moore's Dove White, mixed in Dutch Boy's paint. The pantry door! My husband bought just a regular door from Menards, and then he cut out the detailed section and inserted glass which he frosted. I used a dark walnut stain all over and then painted it in Dutch Boy's Comfort Blue and distressed with sand paper. The Pantry decal was a custom order from MustardSeedDream on etsy, and I love it! 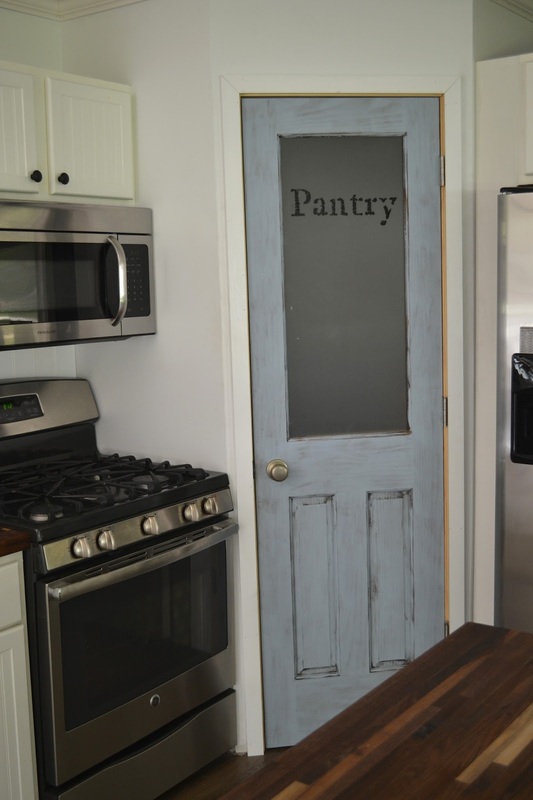 I should have taken a close-up picture, but it has a distressed look to it, which fits in with the rest of our kitchen! And yes, I still need to paint white around the door. It'll happen. These are the lights handing above our island. By the way, the countertops are butcher block from Lumber Liquidators in American Walnut. The lights are actually outdoor wall lights from Lowes! I couldn't find lights with this look in pendant style for less than $150! So I gave my husband a sheepish grin and asked him if he could change these $30 wall lights into pendant lights, and he rocked it! The line hanging down isn't straight, but I don't mind it. They're attached to barn wood. I just love the galvanized look and that they aren't too big. There is a beam that separates our kitchen and living room. You can see it in some of the pictures, and incase you are curious, we did the same finish on it as we did the barn doors. Dark walnut stain + one layer of white chalk paint + distress. I love walking into this room in the morning. It's not always this clean, but I am motivated to keep it clean because I like it so much and we put a lot of work into it. I really love the neutrals. The white and the wood just make my heart happy. I feel at peace with the low amount of action in this room. Oh, those bar stools are from Ikea, and they're countertop height. The sink jute rug I ordered on Amazon. Thanks for taking the tour :) It wouldn't have taken much to make this kitchen better than what it was before, but I'm so thankful to have a kitchen I love! I remember when our realtor showed us the house that I wanted to write it off because the kitchen was so tiny and awful. I'll do Before & After pictures in the next post I do! Thanks, Kelly. I really love that aspect too! ALISHA! This looks amazing!! I think I'd even be motivated to wake up early so I could sit peaceful and read...so long as I could stop staring all around ha;) You guys are doing great! Keep up the good work (and take a break every now and again;)).